The career opportunities in fashion and its related businesses are endless. No matter where your specific interest lies, LIM will provide an education to prepare you for a successful future. LIM College combines a focused academic curriculum with required internships. The success of this approach is reflected in our outstanding post-graduation employment rates. Between internships, coursework, and endless opportunities to gain real-world experience, learn how LIM prepares graduates to hit the ground running when they enter the fashion industry. 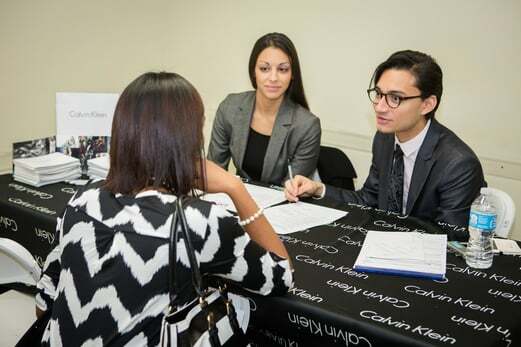 At LIM's Career Fair, students meet representatives from dozens of fashion brands, sharpen their networking skills, and take great strides toward finding a position in the fashion business. 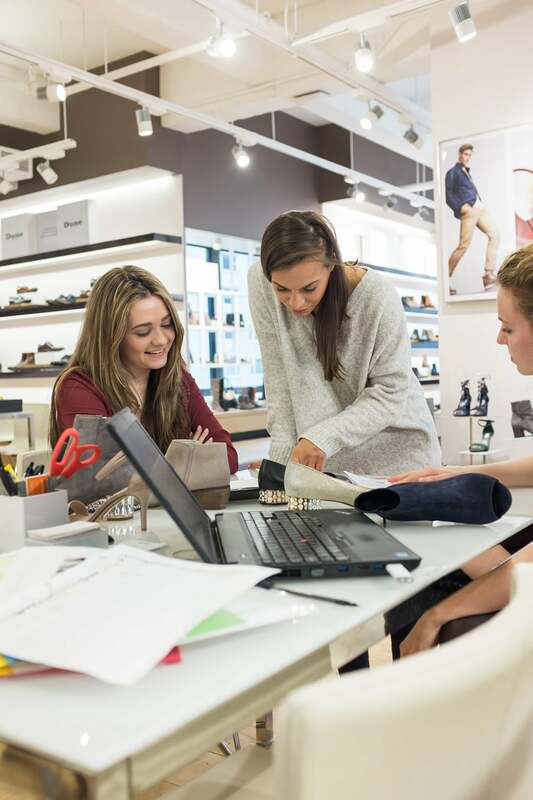 LIM College students gain an extraordinary amount of hands-on experience in the industry through immersion in New York City fashion starting on day one. Educated by fashion industry leaders, our graduates are well-rounded professionals that stand out in the workplace. Hiring an LIM College student or graduate means hiring someone with passion, leadership skills and a global understanding of the business of fashion. Whether you’re a recent graduate or seasoned industry professional, the Department of Experiential Education & Career Management offers employment search assistance and advising services. Our free online job search service for alumni shows entry-, mid- and executive-level opportunities in the fashion and related industries. With fellow alumni living around the world, the Alumni Association provides a dynamic community of fashion professionals through networking events and professional development classes, as well as other opportunities to stay connected. All alumni are invited to join the LIM College Alumni Association to take advantage career-building opportunities while having fun with former classmates. Your resume is a marketing tool and an extension of your personal brand to help land you a dream job. Use these helpful tips to make your resume stand out amongst other qualified candidates. Include the following sections within your resume to give a potential employer a complete story about yourself. Contact Information: Name, address, cellphone number and email address. Professional Summary: As a condensed version of your cover letter, this section is usually three to five sentences in length utilizing descriptive keywords of yourself. Education: Begin with the most recent college you attended with location, expected degree and graduation date. Exclude your GPA if it’s less than a 3.5. Relevant Courses: For students without much related work experience include courses relevant to the job you’re applying for. Work Experience: Begin with the most recent and include employers' names, city and states, your titles and dates of employment. Describe three to five responsibilities and/or accomplishments using bullet points. If you’re still employed, use the present tense; otherwise write in the past tense. Additional Information: In this optional section, illustrate significant personal qualities and extracurricular activities. This includes skills, volunteer experience, affiliations, activities, community service and interests. Cover letters should not exceed one page. Personalize your cover letter to every job. Give an unpretentious air of confidence. Research the company and include what you learned. Always send a cover letter. Format your cover letter to match your resume in font, size, and style. Research the companies beforehand to become familiar with their website and target customers. Understand the position you’re interviewing for. Arrive to your interview 10-15 minutes early. Dress professional with a clean, wrinkle-free suit and polished hair and makeup. Bring copies of your resume and three to five professional references. Ask questions about the position and the company to show you’re interested. Get a business card from everyone you interview with so you can write a thank you card. Practice answers to questions and schedule a mock interview with the Career Development Center. Pay careful attention to your body language and refrain from nervous habits such as toe tapping. Be positive about past experiences when describing school, professors and employers. Ask what is the next step in the interview process. Thank the interviewers for their time and interest and follow up with a thank you note. As an intern or full-time employee, you’re expected to be professional, responsible and dependable in the workplace. We’ve outlined tips to help you stand out and act appropriately to succeed in your fashion career. Show respect and professionalism in all communications. Notify the appropriate people if you need to call out or arrive late to work. Demonstrate you’re eager to learn about the company, industry and possible job responsibilities. Be honest and take responsibility for your actions. Be a team player by asking if others need help and ask for help for yourself. Handle conflict and controversy maturely and professionally. Conduct yourself in a professional matter inside and outside the office. Stay on top of changes in the fashion and related industries with the provided resources. Your education at LIM College prepares you to find exciting professional opportunities through the fashion business. Past LIM College graduates are currently employed at top fashion companies around the world.